London, Europe's biggest and busiest metropolis, visited by 28 million tourists every year. They come for history, culture, and entertainment, but behind the glamour of the bright lights lies a concealed sinister city that most travellers don't get to see. 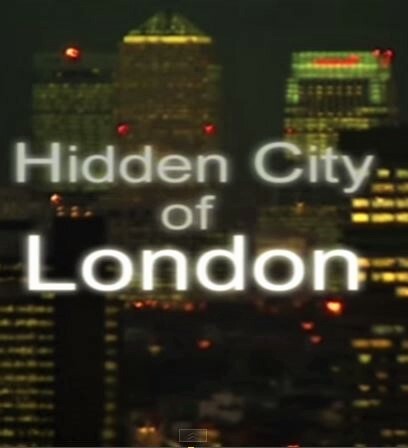 This is the Hidden City of London. London is a city rich in history, but you won't see it all from a double decker bus. In this programme we explore a secret subterranean world. We hunt for ghosts of centuries past, and unravel the most famous English mystery of all, Jack the Ripper. In 1888, Jack the Ripper was the most feared name in London. The Ripper preyed upon prostitutes of the East End, in just ten weeks he savagely murdered five women, but to this day his true identity remains a mystery. In Victorian England the East End of London was a gloomy network of narrow cobbled streets shrouded in thick smog, life here was hard. Each year on November 5th hundreds of bonfires burn across the city as millions celebrate Guy Fawkes Night. Guy Fawkes was a seventeenth century terrorist captured trying to blow up the Houses of Parliament with two tonnes of gunpowder. Fawkes was imprisoned in one of the most brutal and terrifying places of all, the Tower of London. The West End is the Broadway of Europe. This is theatre land with over 40 playhouses in a single square mile. The Theatre Royal at Drury Lane is hundreds of years old, and seats 2500 theatre goers, both living, and dead. Mark Fox has been at the theatre since 1992, he claims to know of at least three ghosts that haunt the building, and he has a possible explanation for one of them. In search of London's darker mysteries we sail up the River Thames to one of the most glorious palaces in England. Hampton Court represents 500 years of royal history, and with it, countless hauntings. Westminster, in the heart of London is Britain's political hub and home to matters of vital national security, but these buildings were not built to withstand the impact of the Blitz of World War II. Instead Winston Churchill's war cabinet held their meets at a top secret location below ground. Now a museum, the Churchill War Rooms have been left exactly as they were when they were abandoned in 1945.